STC.UNM, the University of New Mexico’s technology-transfer and economic-development organization, announced today that it has received a University Center Grant from the federal Economic Development Administration (EDA) to support high-growth entrepreneurs and provide training and technical assistance at all UNM campuses. The grants are awarded through an open and competitive process in five-year cycles across all six economic development regions as designated by the EDA. UNM will join 58 other University Centers across the nation who support and foster economic transformation of their state and regional economies. Kuuttila, who is the PI on the grant, will work with UNM’s Innovation Academy to develop an entrepreneurial training program for students and community members that will be available at the main and branch campuses. The program will be a blended model of training, support, and resources for emerging entrepreneurs provided by experts/mentors who will instruct onsite and through distance learning and teleconferencing that will build relationships and skills. STC and the Innovation Academy will create a new certificate program in Entrepreneurial Capabilities available to students and community members. The program will use existing programming and include offerings of up to 20 different seminars each year on topics such as Intellectual Property Basics, Pitch Deck Basics, How to Pitch Your Business, Starting a Business, Market and Business Model Validation, Lean Startup and Customer Discovery, and Investments. Participants who attend at least 60% of the seminars (12) will be awarded a Certificate of Entrepreneurship and Innovation. The EDA University Center Economic Development Program’s mission is to make university resources available to regions that are under chronic and acute economic distress due to, for example, high unemployment and low-income levels. A university’s specialized research, sophisticated labs and faculty expertise, industry collaborations, and its technology-transfer and commercialization capabilities are resources that can be used to respond to the economic-development needs of local and regional communities. These assets can advance STEM and entrepreneurial skills statewide, provide workforce training opportunities that are matched to the needs of local employers, and provide technical and business expertise for new company growth. To read the EDA press release go to https://www.eda.gov/news/press-releases/2018/09/27/uc.htm. See also Kevin Robinson-Avila’s October 5, 2018 article, “UNM, San Juan College to expand entrepreneurship programs,” from the Albuquerque Journal, and Tasawar Shah’s October 7, 2018 article, “Federal government gives grant for economic development,” from DailyLobo.com, reprinted below. ALBUQUERQUE, N.M. — The University of New Mexico and San Juan College in Farmington won five-year federal grants of $560,000 each in September to expand their entrepreneurship programs. Both New Mexico institutions are among 58 colleges and universities selected by the U.S. Economic Development Administration to support economic transformation in local and regional economies. EDA’s University Center Grant program awarded the funding to extend university resources in marginalized areas plagued by high unemployment and low income. UNM will use its money to expand entrepreneurial innovation initiatives to branch campuses around the state. San Juan will assist local farmers and value-added food businesses to grow existing operations and launch new ones. UNM’s Science and Technology Corp., which manages tech transfer and commercialization programs, will work with UNM’s Innovation Academy to bring educational and technical resources to rural areas. 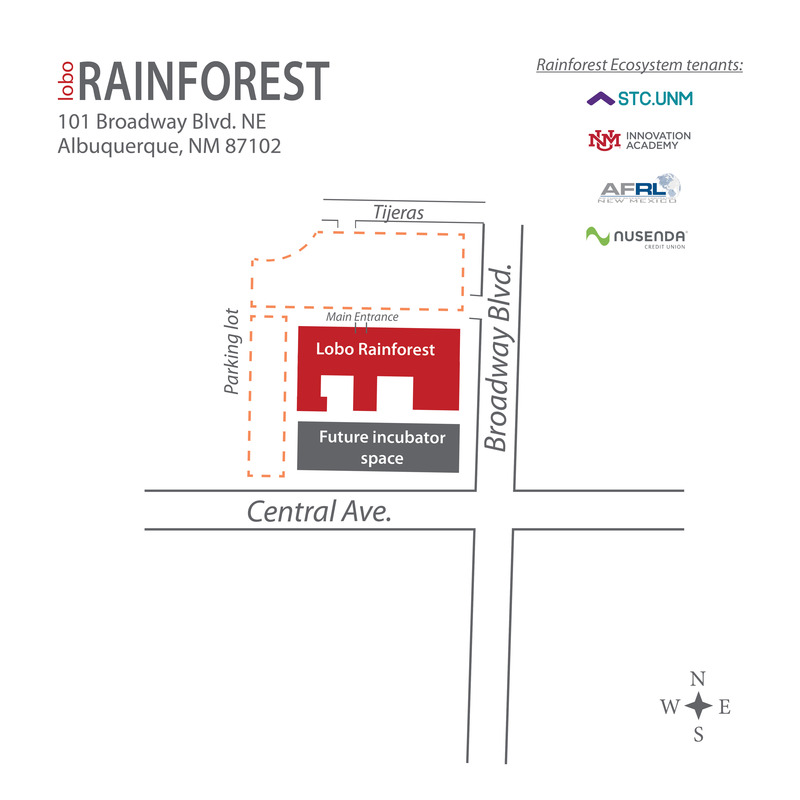 UNM programs are currently concentrated at the Lobo Rainforest building at the Innovate ABQ high-tech development zone in Downtown Albuquerque. That includes UNM sites in Rio Rancho, Taos, Los Alamos, Valencia and Gallup. University experts and mentors will offer training and resources for aspiring and emerging entrepreneurs through onsite instruction, distance learning and teleconferencing. A new Entrepreneurial Capabilities certificate will be available for students and community members at branch campuses. Seminars and a for-credit course will teach everything from starting a business and intellectual property to business pitches, lean startup strategy and customer discovery. Innovation Academy Executive Director Rob DelCampo called it a “natural extension” of the work now underway at the Academy in Albuquerque, which currently has 874 students and 36 student-run businesses. San Juan will focus on building a regional “food hub” in the Four Corners area with training for new and existing growers, value-added businesses, and people working in culinary arts, said Director of Workforce Development Lorenzo Reyes. The college will help establish a commercial kitchen and a centralized marketplace. The University of New Mexico’s organization for Supporting Technology Transfer and Catalyzing Economic Development (STC.UNM) has received a five-year grant from the federal U.S. Economic Development Administration (EDA) under its University Center Economic Development Program to foster economic development in the region. EDA is a bureau within the U.S. Department of Commerce. EDA’s University Center Economic Development Program makes the resources of universities available to the economically developing community. Using the grant awarded, STC.UNM will establish a university center to promote economic growth in the region. According to the EDA’s Website, the U.S. Department of Commerce has invested $2.5 million to strengthen innovative and economic growth initiatives. Colleges and universities in 13 states have been awarded funding through economic development competition. STC.UNM is one of the EDA’s 2018 university center competition grantees, along with many other announced by its regional office in Austin, Texas. The funding is awarded to different universities across the country through a competitive process that explores the ways to promote and enhance economic growth and activities in respective regions, according to the EDA website. The project description on the website states STC.UNM will receive $112,850 through the Lobo Rainforest to support high-growth entrepreneurs. It will also provide training and technical assistance to UNM campuses across the state. The website also says STC.UNM will develop new seminars and use existing programming to create a certificate program in entrepreneurial capabilities and will provide professional development opportunities through a blended model of training and support. STC.UNM does commercialization work for the University. Kuuttila’s office partners with other University organizations, particularly the UNM Innovation Academy, she said. The focus is on two primary audiences — students and community, she said. STC.UNM plans to focus in on the graduate and undergraduate students from all of UNM’s campuses and the surrounding communities. Kuuttila said students will receive credits if they attend training sessions and seminars offered by the STC.UNM, adding that people from the communities will get certificates for attending sessions and seminars. STC.UNM and the Innovation Academy intend to contact the heads of all branch campuses to inquire about the particular needs of their communities, Kuuttila said. “We are focusing on the use of technology in the business and we are calling it e-commerce,” Kuuttila said. STC.UNM also plans to introduce some new courses like the one already being offered by the Innovation Academy titled “I can build my business (create, sell, bank)” to enable and promote business and entrepreneurship. With the STC.UNM, Innovation Academy plans to launch an online blended model “course for credit” across all the campuses, DelCampo said. This model will train the emerging students and people from the communities. These students will be guided by experts and instructors. Tasawar Shah is the news reporter at the Daily Lobo. He can be contacted at news@dailylobo.com or on Twitter @tashah_80.